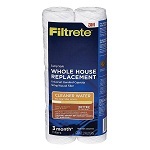 Filtrete whole house water filters and systems remove chlorine and other contaminants in your water system. 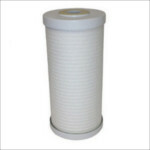 The Filtrete 4WH-HDGR-F01H replacement grooved filter protects plumbing and home appliances by removing sand, sediment, silt, and rust among many other contaminants frequently found in water supplies. 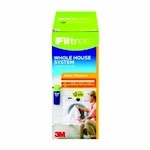 The Filtrete 3WH-STDSW-F02H replacement water filter protects plumbing and appliances through your whole house.